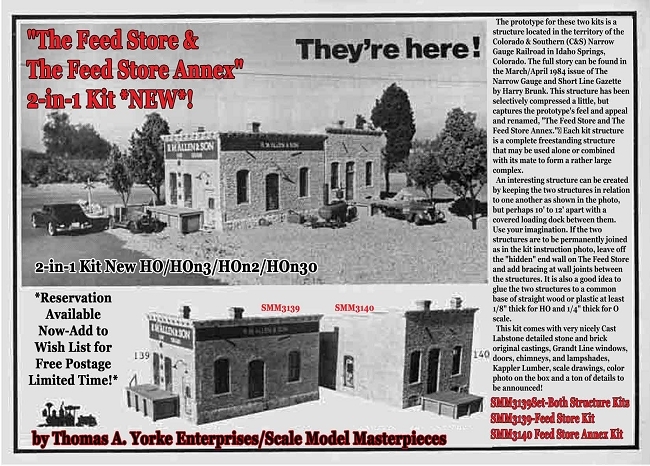 "The Feed Store and The Feed Store Annex" 2-in-1 Kit *NEW*! The prototype for these two kits is a structure located in the territory of the Colorado & Southern (C&S) Narrow Gauge Railroad in Idaho Springs, Colorado. The full story can be found in the March/April 1984 issue of The Narrow Gauge and Short Line Gazette by Harry Brunk. This structure has been selectively compressed a little, but captures the prototype's feel and appeal and renamed, "The Feed Store and The Feed Store Annex. " Each kit structure is a complete freestanding structure that may be used alone or combined with its mate to form a rather large complex. An interesting structure can be created by keeping the two structures in relation to one another as shown in the photo, but perhaps 10' to 12' apart with a covered loading dock between them. Use your imagination. 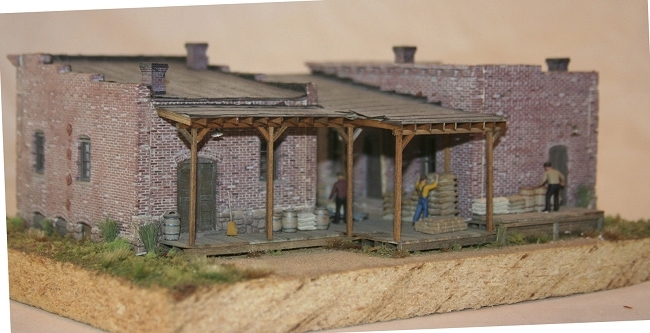 If the two structures are to be permanently joined as in the kit instruction photo, leave off the "hidden" end wall on The Feed Store and add bracing at wall joints between the structures. It is also a good idea to glue the two structures to a common base of straight wood or plastic at least 1/8" thick for HO and 1/4" thick for O scale. This kit comes with very nicely Cast Labstone detailed stone and brick original castings, Grandt Line windows, doors, chimneys, and lampshades, Kappler Lumber, scale drawings, color photo on the box and a ton of details to be announced! Optional Roofing & Stains/Solutions Choices! Review this Kit & Be Rewarded!